DiskMax deletes junk files and other unnecessary data from your system that take up precious disk space and slow down your computer. 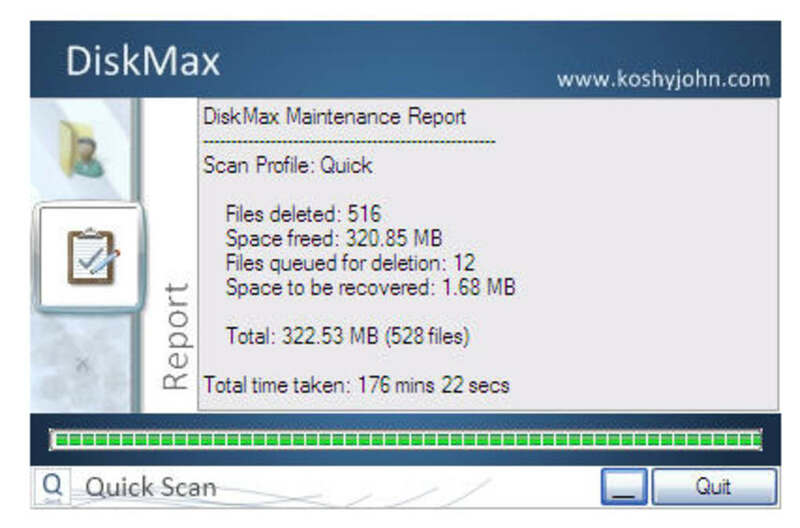 With DiskMax you can then recover disk space and improve system performance in an easy way. The program is really simple; in fact, so easy it doesn’t have any settings or configuration options – something which those of you who like to have control over everything may not be that happy about. DiskMax includes four types of analysis (Quick, Standard, Detailed and Complete) which range from the simplest one to the most feature-rich one. 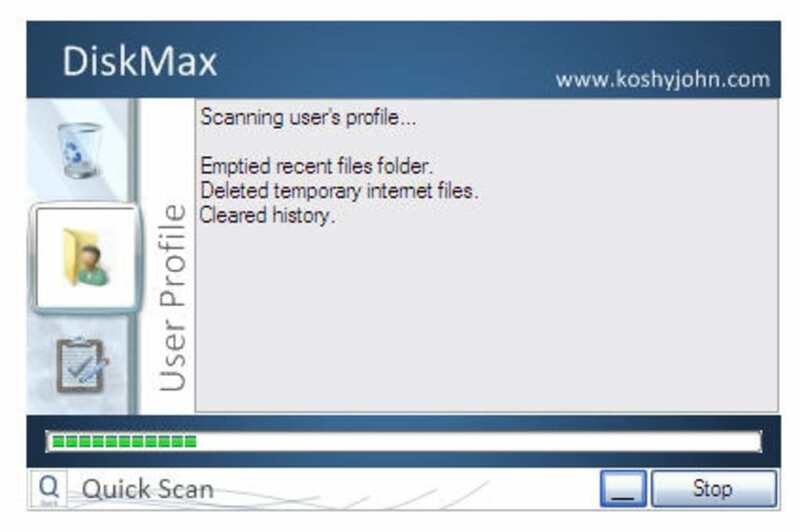 Some of the areas scanned and cleaned include the Windows Registry, web browsing data (cookies, history, form autocomplete and so on), temporal files and the Recycle bin, among others. No matter which type of analysis you choose, DiskMax cleans up space quite fast. The best thing about DiskMax is that it does all the work by itself. 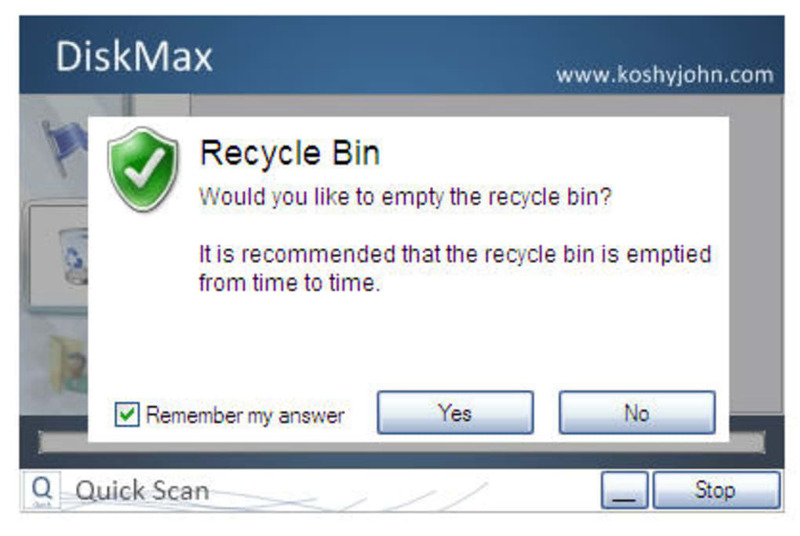 You only need to answer a question every time the program tries to delete a new item, but you can then mark your answer to be remembered. Other than that, DiskMax works pretty much on its own – something that, if you've instructed it carelessly, could actually damage your system. DiskMax cleans up garbage in your hard drive so that you can easily free up disk space. Fast, Light and Free. I have checked them all, and for my netbook I find this by far the best solution. It does not impact on the rather light RAM of only 2Gb (max) and it has found junk others apparently missed. Fast | Thorough | Light | Free | Cute. Very Powerful Free Disk Cleaner. 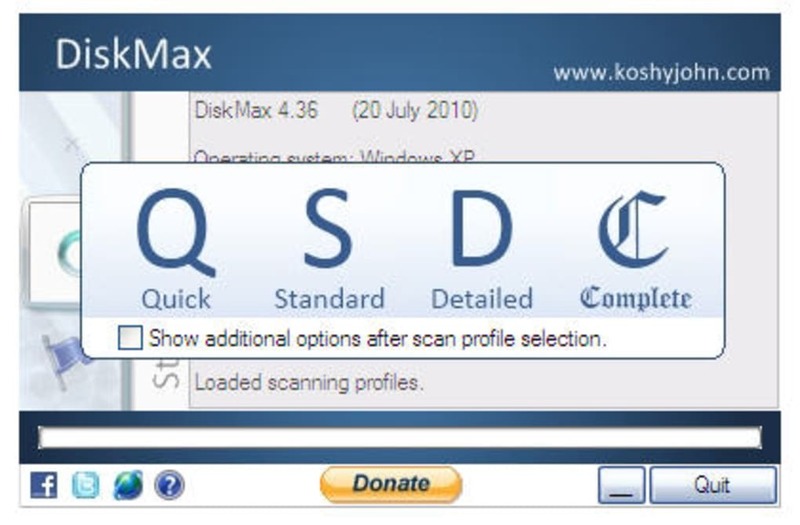 DiskMax is a very powerful free disk cleaner. It's pretty fast and does an amazing job. It is the only free disk cleaner that I've used that actually restores hidden windows updates. It's also so powerful it can actually remove all bookmarks, something else you don't usually see in a free disk cleaner. You will be amazed at how much space it cleans and how quick your computer will become. I have been looking for a great powerful disk cleaner ever since Dustbuster was discontinued. Looks like I finally found it. 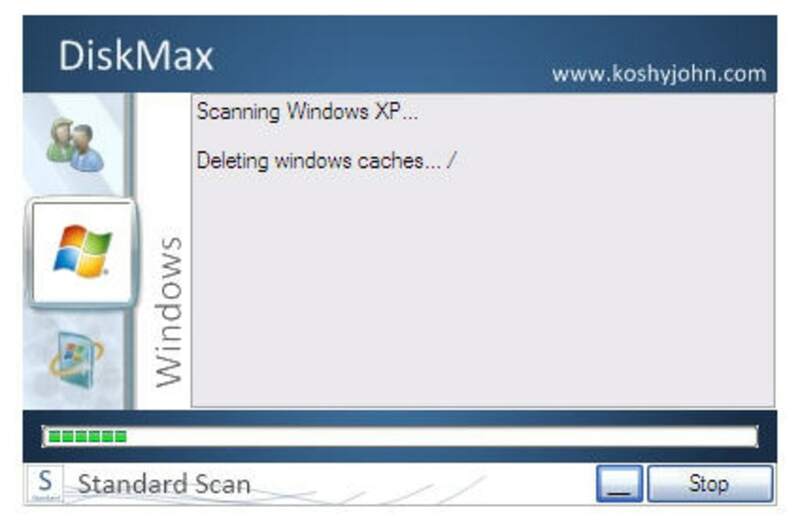 The downside to DiskMax is the fact it doesn't install in the programs files folder instead it installs in the AppData folder [look for KoshyJohn.com]. So you have to unhide hidden folders to access it to uninstall it or change it's settings. Another downside is the fact you can't change settings within the program itself and instead need to go into the install folder then go into the data folder, click on the options.ini and change the settings from within there. 1 enables options while 0 disables options then after your done you need to save it. Overall I recommend this to anyone who wants to save space as it truly does clean your computer and make it faster. If your a novice READ EVERY OPTION BEFORE CLICK &quot;YES&quot; OR &quot;NO&quot; during initial run. I myself would make sure to click &quot;no&quot; on deletion of bookmarks (Firefox it's the history option). And also click &quot;no&quot; for defragging and prefetch optimization which I would instead entrust to your current defragger of choice. Saves A Lot Of Disk Space. Difficult To Configure After Initial Run. Have To Unhide Hidden Folders To Uninstall Or Change Options. What do you think about DiskMax? Do you recommend it? Why?